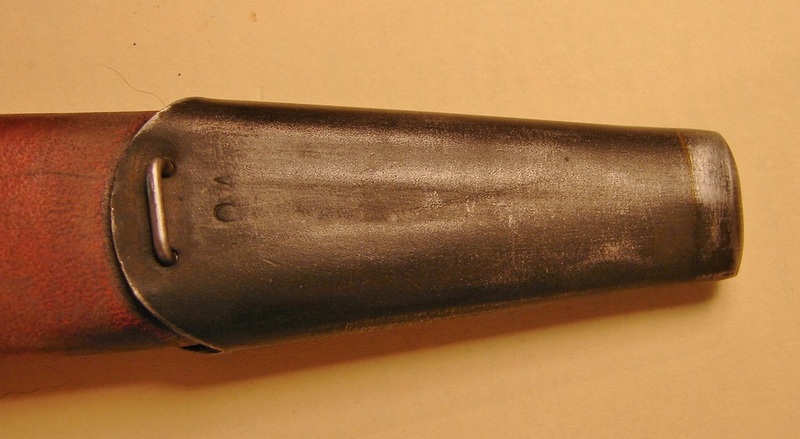 In general, from the P-2 knives onwards they used mostly blackened chapes unless the knife was nickle plated. It is interesting that the manufacturers would be concerned about this small matter of aesthetics. 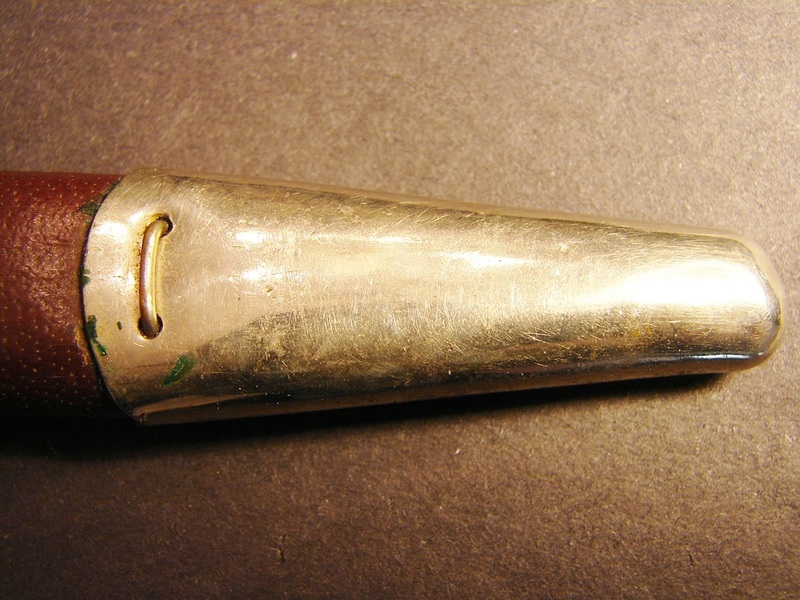 Brass tube chape loosely crimped in place. This one also has a frog attached with two staples. 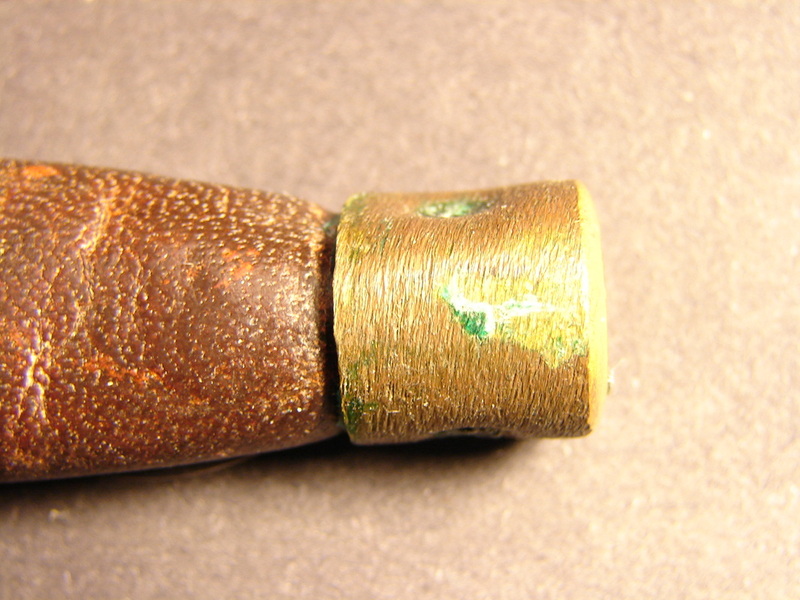 Flimsy, painted, brass chape held in place by a rivet on a poor quality post-war sheath. Nickle plated chape held in place by a staple. 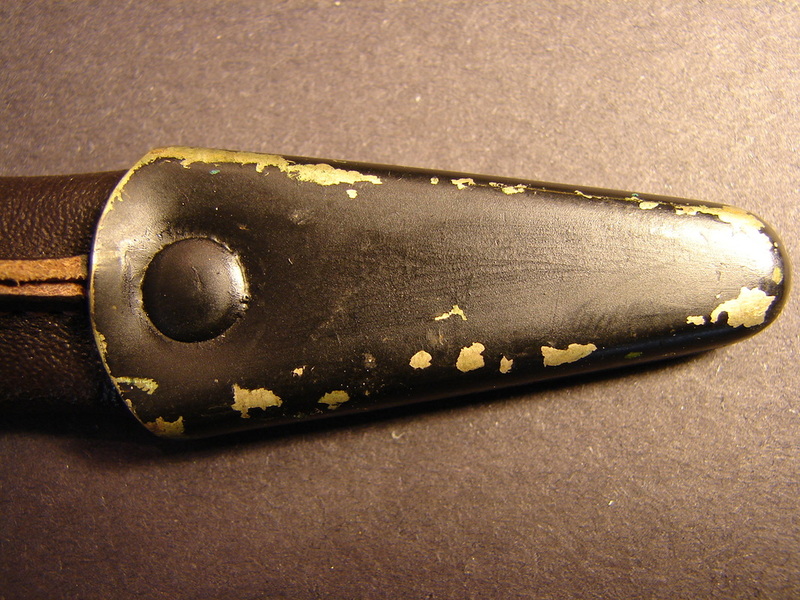 Typically found with nickle plated P-2 knives. Unusual broad Alloy tip found only on the sheaths for Fatman knives. Unknown manufacturer. Below: A few more details of the chape attachment methods. Also note some chapes had a raised rib to accommodate the seam, some had the seam shaved off where it entered the chape. Some chape are riveted on the front and others on the back. The same for the use of a staple. Some chapes are round tipped while others are the flat truncated style. It is impossible, in most cases, to determine if the sheath with a knife is actually the one it originally came with. Sometimes wear patterns will give you some idea of how long that particular knife was in that sheath. 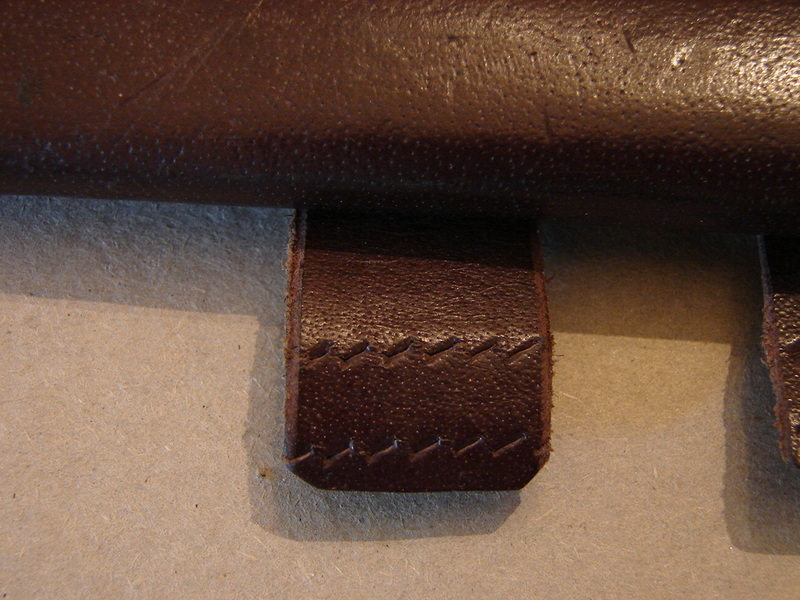 Below: Here are some detailed photos taken of a First Pattern Sheath that does not have the typical Newey glove fastener. 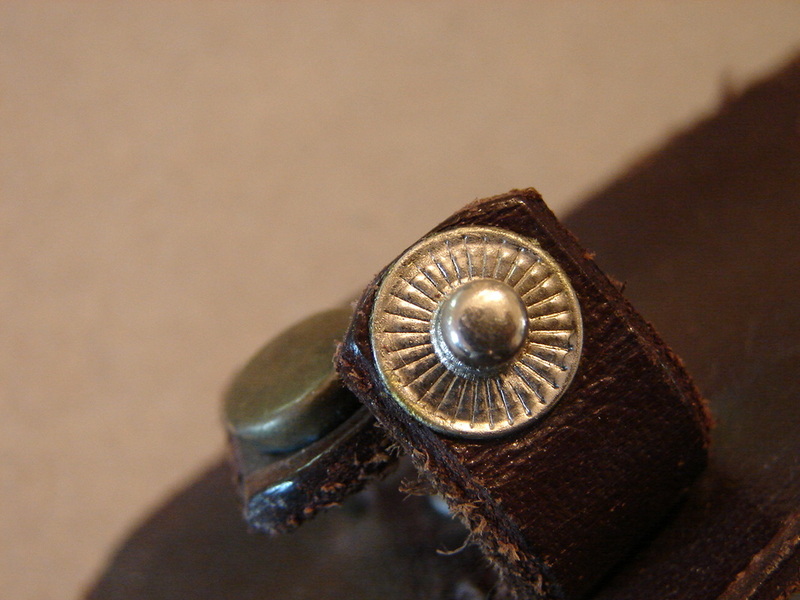 The backside of the fastener has small flowers embossed in it. 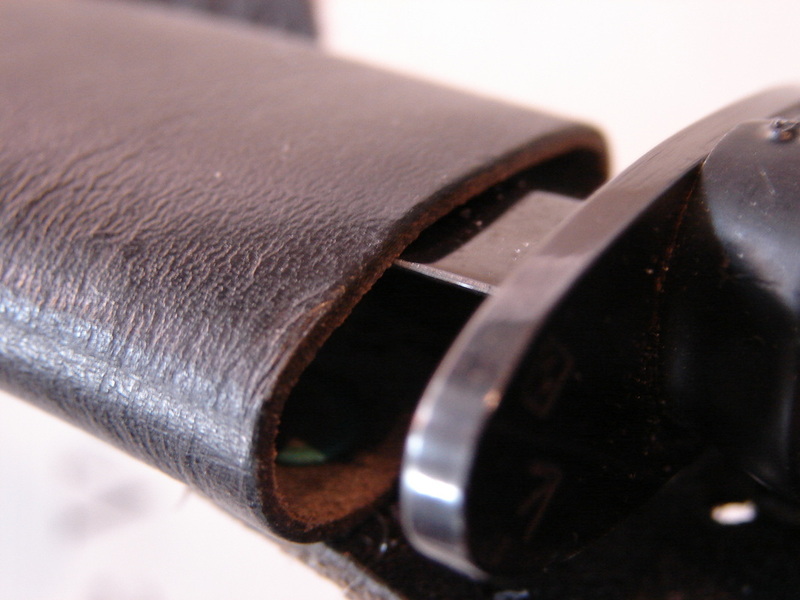 Also this sheath has the staple located on the front of the chape. 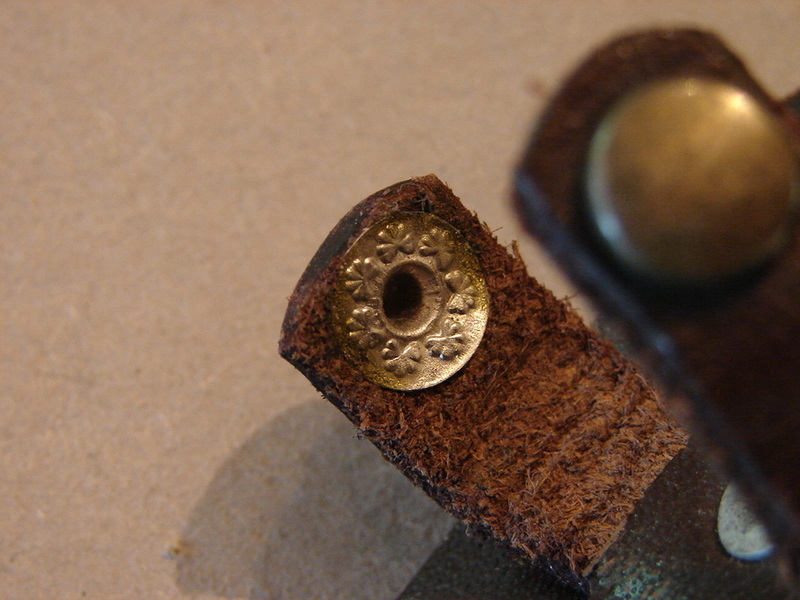 The close-up of the sew tabs illustrates the angled punched holes to facilitate the passage of needle and thread. 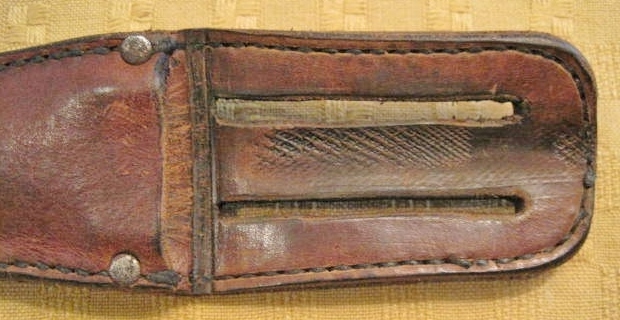 The majority of modern FS knives are sheathed in what can best be described as a leather pouch. 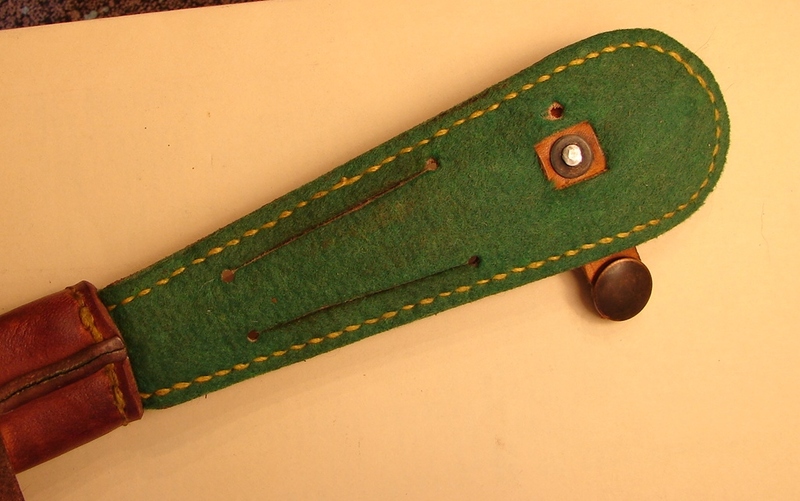 Made from soft floppy leather and overly baggy, the knife wallows around in the sheath. Shown at the right is an example of what I mean. 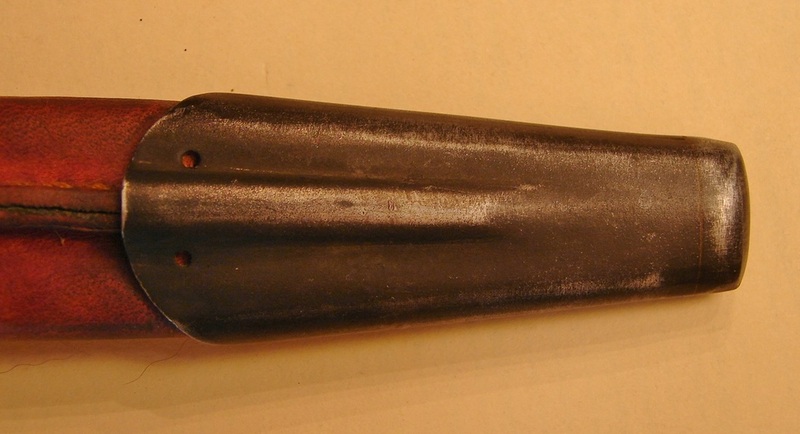 There are much better sheath options but through nostalgia or romance modern Fairbairn-Sykes still come in the standard leg sheath. 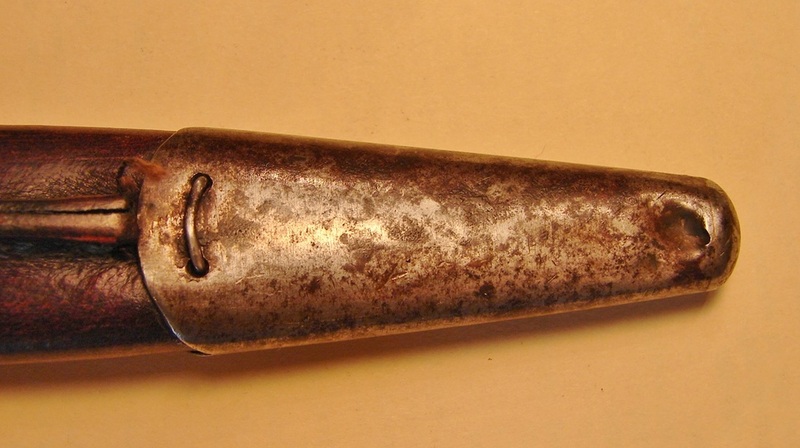 The exception to this is the Eickhorn model illustrated in the section on Post-war knives. 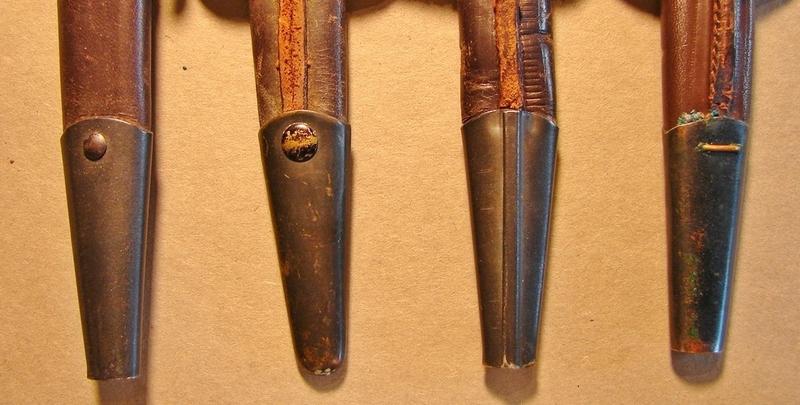 The Eickhorn sheath (shown under the main "Sheaths" header) is more like one you would find on a Randall knife. 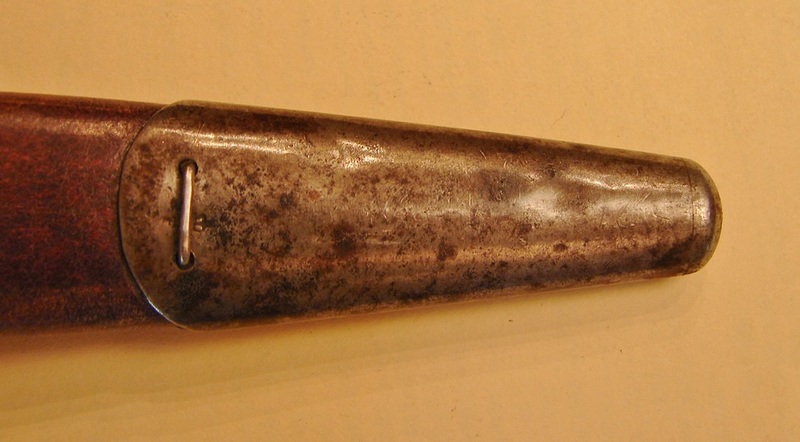 Below: X-dagger sheath details. The two photos on the left are from the knife with the thumb recess in the guard. The two images on the right are from the knife with the three inch guard. 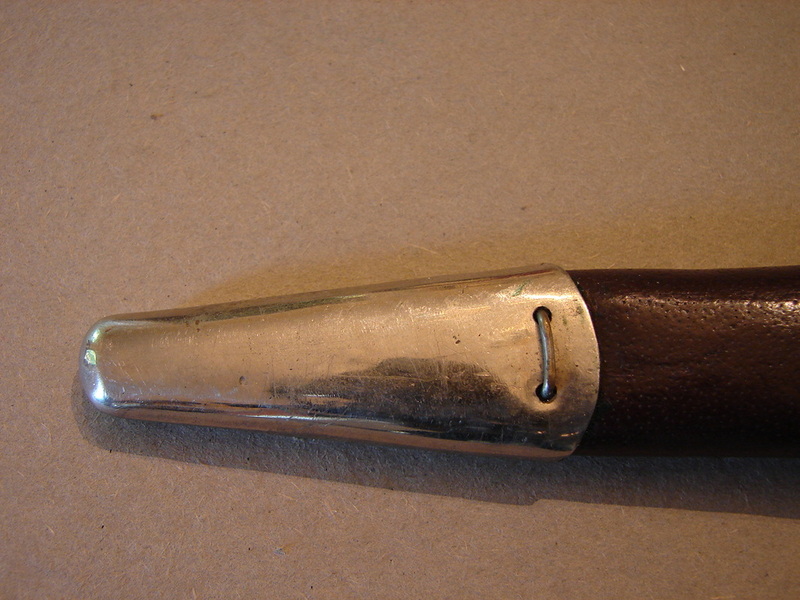 The tips appear to be taken from used bayonet sheaths. 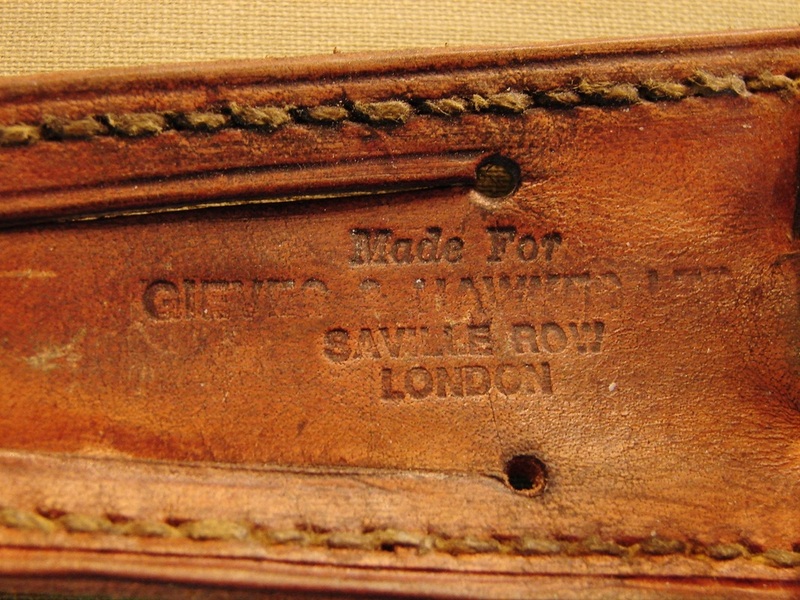 Below: this photo is the backside of the frog shown to the right which is stamped Gieves and Hawkes. The X-dagger with 3" blade came in this sheath.